Darkmoon is a rich, nonindustrial water world, which has 90% or more of its surface covered in an ocean of water. It is a member of the Third Imperium in the Lemish Subsector of Corridor Sector in the Domain of Vland. During the Second Imperium this world was named Muumma. 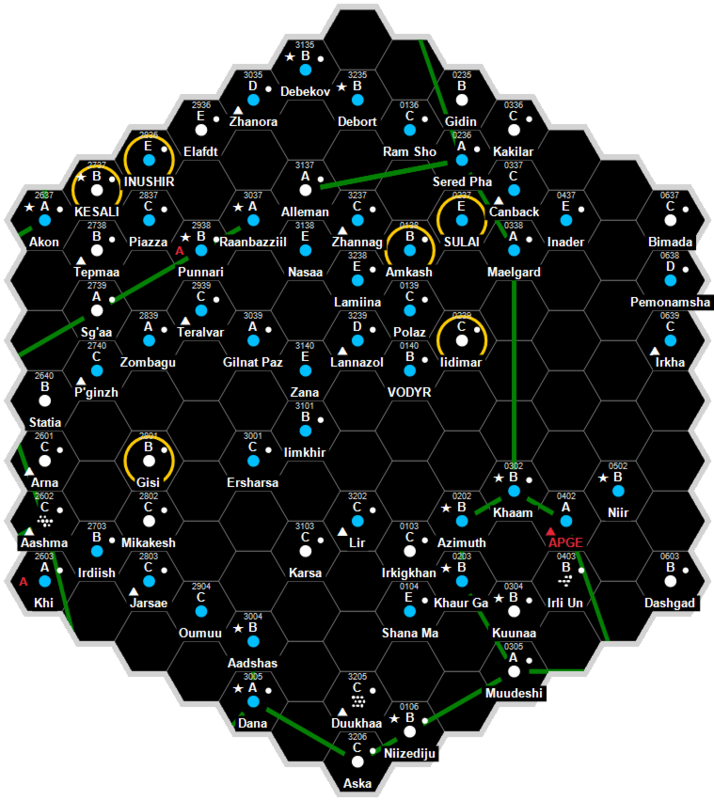 The Darkmoon System lies in the Naadi Subsector of the Corridor Sector that connects the Spinward Marches to the core worlds of the Third Imperium. Lying off the beaten track, the main world is Tsenjia, a low population water world with little in the way of indigenous life forms, which has been stocked with Terran sea life. For much of its Imperial history, the system has been home to a Naval base on Darkmoon, a moon orbiting the outermost gas giant. Darkmoon is also a water world, but one that is trapped beneath a thick layer of ice and kept in liquid form by the tidal effect of the gas giant. The Ministry of Colonization approved of plans to seed Tsenjia in the Darkmoon (Corridor 2111) system with Terran-derived organisms in 447. By 695, imported fish stocks on Tsenjia in the Darkmoon (Corridor 2111) system reached an exploitable level. A modest export trade begins. Almost all higher native species are extinct by this time. Darkmoon has a pressure of 1.50 to 2.49 atmospheres. The base was actually home to the System Defense Boat and Space-Submarine Warfare School, devoted to training in the tactics and methods necessary to assault and defend water worlds (specifically against System Defence Boats operating from under the sea). Yet when the base was closed in 902, life on Tsenjia declined, including a drop in the system's tech level from TL9 to TL7. Fortunately since 1105, life has improved in economic terms for the seven million inhabitants of Tsenjia, after the mega-corporation, SuSAG, opened the Darkmoon Imperial Prison for over three thousand inmates. The medium and maximum security TL12 facility, lies on the floor of Darkmoon's ocean, making escape rather difficult. Of course, inmates are expected to work while they serve out their sentence and the corporation gives them two choices. The first is as test subjects for SuSAG's biochemical research division, and the second is as part their underwater salvage program. Darkmoon, as a member world of the Third Imperium, holds the estate of two members of the Imperial Nobility, who are charged with overseeing the world. Darkmoon has a poor quality starport. Darkmoon is a Captive Government or Colony. Darkmoon possesses a Technology Level of TL–7. This page was last modified on 13 February 2019, at 18:33.